It might just be a one-off prototype, but new parents who can’t go anywhere without a toddler in tow will love the idea of a stroller with built-in sensors that allow it to autonomously follow someone, while intelligently avoiding collisions. Supposedly built by Volkswagen with the same adaptive cruise control and collision sensors used in a Golf, the addition of an electric drive motor lets the stroller stay a few steps behind someone so they don’t have to worry about pushing it around, or crashing into someone. 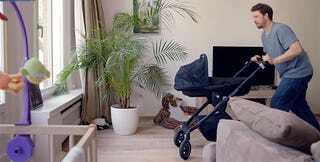 The last time we checked, there’s no such thing as car insurance for a stroller, so this idea isn’t that crazy. Of course, the stroller could also very well just be a publicity stunt, steered by someone off-screen using a wireless remote. That would certainly be disappointing, especially for parents who are tired of wearing a baby carrier to keep their hands free while out and about. So here’s to hoping VW did actually build this, and that there’s enough consumer demand to take it past the prototype stage.